Wells Fargo Bank recently lunched their new service, “The Commercial Electronic Office (CEO) for Mobile Deposit Service”. Wells Fargo Bank designed their CEO Mobile Deposit service specifically for corporate and commercial baking customers. Wells Fargo & Company said about their new CEO portal service that, it will allow the commercial and corporate customers to capture money order and cheek images and deposit funds to their Wells Fargo commercial and corporate bank accounts with their mobile anywhere, anytime. 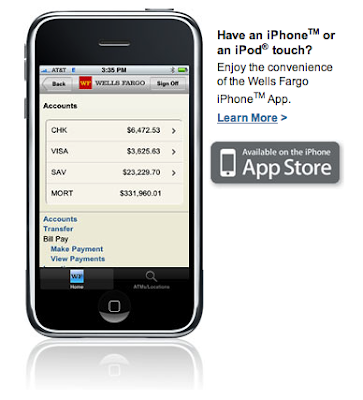 Wells Fargo CEO Mobile Deposit services can usable to those corporate and commercial customers who using iPhone 3GS or its above version. Wells Fargo also ensure online security of their online banking system. The executive vice president of Wells Fargo Bank Steve Ellis said back in 2007 who also known as the head of wholesale services of Wells Fargo that, they were the first bank to offer CEO Mobile Deposit services for commercial and corporate customers of Wells Fargo Bank. Wells Fargo Bank continue to improve their services with their customers to design and build new and easier services that make their lives comfortable and easier.